Size of the product: 18" (L) x 24" (W). 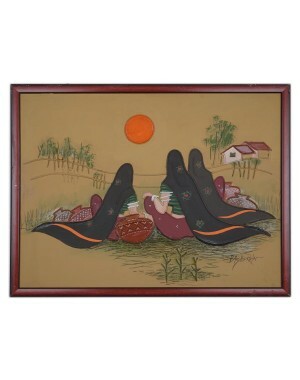 Mud painting art is origin of Kutch, Gujrat. The mud painting which are created by mud with sheer vision of customary design and art at heart by the experienced Gujarati workers of Kutch, Gujarat. These painting are based on traditional concept of clay art that is only found in Kutch. Mud painting also known as Lippan work. This painting are very real in look. Artisans use their artistic mind and techniques to come up with new ideas to make such kind of beautiful paintings. Majorly it represents the culture. This painting is made with washable color on Medium Density Fireboard (MDF) and Plastic polyvinyl chloride (PVC).